Towards the end of last year, we had the privilege of hosting a young Indian couple in our home. For security reasons, I will call them YM and Joy. They are seeing a remarkable move of God happening in their area. One afternoon, I sat down and interviewed them. The following few blogs will be the transcript of that interview. FD: Tell us something about the move of God that you are seeing. YM: N India is where we are focused. From the year 2000 onwards we started seeing many people respond to the Gospel. Prior to that it was very hard. FD: Can you account for the difference? YM: At first we did not know any strategy for church planting. When I first met Victor Choudhrie, I was pastor of a traditional church. He asked me if I was satisfied in traditional church. At that time we had 60 families in the church. He went on to say, “No, this is not your calling. You are called to be an apostle, not a pastor." It took me two years to say yes. One day Victor visited our church again and basically dismantled it. I went to his place and trained for 10 days. Then I started to church plant using a strategy based on Luke 10. I decided to test prayer walking. I adopted two villages. In one I prayer walked and in the other I did nothing. After a few months, the village where I prayer walked had 45 families come to Christ. I was chased out of the other village! Our strategy is to prayer walk for three to six months. During that time, houses start opening. People ask why we are praying in their village. They come with prayer requests. “My son is sick; can you pray?” We see miracles. From 1989 to 2000, I started just one (traditional) church with 60 families. With the new strategy we now have 962 churches in 7 years. Our definition of a church is that it has to have 10 baptized members. If it has less than that we do not call it a house church but a house group. We have more than 1,500 house groups. Each house church has five or six families so there are 20 to 30 people in a typical house church. We now have 20,000 baptized people in the movement. FD: Why are you so specific about the numbers? YM: We do not want the work to come into disrepute because we have exaggerated the numbers. These groups have all been verified. There may be even more than that. FD: How much of this growth do you think is the method and how much God’s intervention? YM: If a strategy is from the Lord it will work. This is God’s time for India. People have never been so responsive before. In the city where I live, up until the year 2,000 the Christians were 0.17% of the population. Now after 7 years it is 0.67%. It has grown by three times. This is an indicator of God’s movement. We are seeing miracles in every village. We are now a pre-Christian nation. FD: Tell us something about the lifestyle of the believers. Joy: In our movement we meet twice a week, not necessarily on Sunday. It depends on which day the people have off. They meet together in the evening. Hindus worship in the early morning and make offerings to the sun or to plants. Believers use this time to get into the Bible and to pray. In the evenings they come together for Bible readings, to sing songs and pray and to bring in their neighbors. There is praise and worship. We use Hindu music but with Christian words. Many of them are oral learners so they do not learn by reading the Bible in their meetings. One of the biggest changes when people become believers is that the believers keep their homes clean. Before they became Christians they were very dirty—they threw their garbage outside the house and the houses were very dirty. Now they clean everything. Their houses are clean. They send their kids to school. They try to dress neatly. They take out the pictures of Hindu gods and goddesses that they used to have on their walls and replace them with Bible verses. Anyone can see they have transformed from one religion to another. They are always eager to share Gospel. We have trained them in this from the beginning. 70% of the people in our area are non-literate. When we are forming a relationship with someone we pass on testimonies. We use dialog and other tools to teach them. They will not understand if we just recite Bible verses,so we use story telling. We have a story for everything. We go through the stories and then ask questions. We go through chronological stories so we tell them about creation, sin, repentance. They learn what Jesus wants and who we are in the sight of Christ. YM: Hindus do not have a concept of sin. If you ask a Hindu if they have sinned, they will ask, “What is sin?” They think they have never sinned. We have to tell them that idol worship is sin. All of them have worshiped the sun and plants and animals. Then we teach them about other sins. We pray with them to break any curse going back three to four generations and then lead then to accept Christ as their personal savior. The first thing we emphasize after this is relationship. We try to teach through own lives and experience. When they come to us with problems we start to discuss it with stories. We explain to them the principle and morals of the stories. We relate the stories to their needs. We also disciple through dialog. As part of the discipleship process we teach the new believer, “You are also a church planter. We immediately release them to plant churches. Since that time they have planted 16 churches in Bhutan. My wife, Joy, has trained 305 women. She said to me, “You are doing everything for the men. If you teach a man you just teach that man. If you teach a woman, you teach a whole family. If you tell them, 'Don’t tell anyone but your relatives,' the first thing they do is to tell the community." So we find it we reach the women, the whole community comes to Christ. These 305 ladies started 763 verified house groups within 10 months. 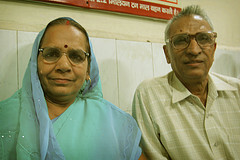 Great story from first-hand pastors in India. I just returned from India last Tuesday–the state of Andhra Pradesh. I traveled with US evangelist, Tom Elie (www.oasisworldministries.org) and accompanied him on two 5-day Open Air Festivals. We visited the city of Challapalli, near the coast of the Bay of Bengel, and Armur, about 170 km north of Hyderabad. Ran into some opposition from militant Hindus in Armur area. Saw about 9,500 people make first-time commitments to Jesus over the 10 days of festivals. God is moving all throughout India, it appears to me. Opposition is rising too. Probably a good sign–Satan is taking notice and is countering the gospel. I am a missionary form last two years. I am south Indian (tamilian).I completed my education in MPat dist jabalpur and also worked as a missionary over there. God gave me a vision to go punjab to plant church .And now I am in punjab.And here many people ready to accept christ and many young pastors are working but not theologicaly educated ,and many baptised belivers are there. these young pastorsare waiting for an organisation to support and build a church building for them.These pastors are unmarried.So when I came I found this ,and the vision given by God came true .So I thought that why not an organisation can help them. So if you are willing to do this, it will be very use full for building the kingdom of God .If God leads you then please contact me in (e mail) or mobiel:09779485301.Glory to the name of the lord. We are “Shanthi Gospel Ministries” PREACHING THE GOSPEL, PLANTING CHURCHES, TRAINING AND SENDING MISSIONARIES, ORPHANAGES & CHILD LABOR ELIMINATION TRAINING & VOCATIONAL SCHOOLS, and strengthening people with the WORD OF GOD, Social Awareness programs by every means at our disposal with love in action, for God’s glory. Shanthi Gospel Ministries is a Holy Bible based, Christ–Centered, Indigenous and multicultural Faith ministry, non-profit organization established in India in 2001 with a Vision For India to reach the unreached people. Shanthi Gospel Ministries is administered by a Board of Directors comprised of Indian, governed by an Executive Committee and General Body. All board members work in an honorary capacity and do not take a salary or any other compensation. Shanthi Gospel Ministries is not involved in any political nor lobbying activities. Shanthi Gospel Ministries is here to support, enrich, train and provide a spiritual and Physical /prayer covering for the Body of Christ ,encouraging fellowship and unity among all believers and Churches regardless of denominational affiliation (Eph. 4:4-6). Having been given the knowledge to understand that you are assisting organization in the categories mentioned below. We hereby request your partnership and assistance for our future correspondence and partnership with you. Hope you will kindly oblige. Oddly enough, Ive talked randomly to a lot of young Christian women ( 17/ 15 ) at my church and at school, and a surprisingly large number of them feel a call to preach the gospel to India ( including myself ). Its not a coincidence. God is definitely calling to India. The next few years in India is going to be interesting indeed.